Tampa, FL—The Daily Discord’s para-abnormal research team poured over thousands of photos and images of Clint Eastwood’s infamous address at last week’s convention. Using the latest para-abnormal equipment, also known as Photoshop, our team has finally discovered who Clint was talking to that night. The Daily Discord is 99% sure Mr. Eastwood was addressing, Clyde, the orangutan from that Any Which Way But Loose movie from 1978. Clyde died under mysterious and possibly violent circumstances shortly after the sequel in 1980, Any Which Way You Can totally ending any chance for the next movie, Any Which Way to Make Money. There’s nothing like a Warner Brothers movie with allegations of animal cruelty. You should have seen what they did to Bugs Bunny every Saturday morning. His catch phrase “What’s up Doc?” began as he regained consciousness each morning in various Southern California hospitals. But why Clyde? 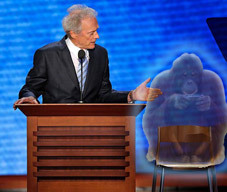 Is Mr. Eastwood still unable to cope with this tragedy? Does Clyde still blame Eastwood for his death? And, perhaps more importantly, does the death of such a primate still constitute an irreparable loss to Republican Party strategists? Our own field reporter, Cokie McGrath, has evidence the GOP is collaborating with Mr. Eastwood on a third installment to this important series, Any Which Way But Truth.